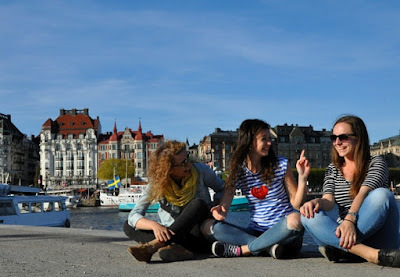 Campus Abroad Educational Services: STUDY IN SWEDEN. Sweden, the third largest country in the European Union, is located in Northern Europe. With a population of nearly 9.5 million, it has a low population density. Sweden remains a popular destination for its "nature tourism", receiving international visitors from the world-over who enjoy its breath taking scenery and untouched wilderness. Sweden's cities like Stockholm are well known for its rich cultural heritage and idyllic setting; the cities are spread out across 14 islands. Gothenburg, which is Sweden's second largest city, offers multicultural experiences and a vibrant entertainment scene, and Malmo is a bustling cosmopolitan city. In the year 2013, the Reputation Institute rated Sweden to be the second most reputable country world-wide. Sweden currently has nearly 35,000 international students as part of its vibrant study scene.